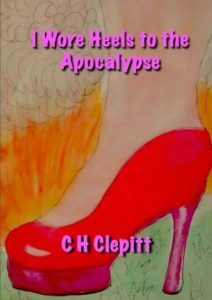 I WORE HEELS TO THE APOCALYPSE is totally and thoroughly hilarious! I scared the dog several times laughing at various points throughout the book. Who hasn’t felt all at-sea and incompetent to other people… even if those “competents,” well, they really aren’t much. Kerry is everywoman, hoping there’s no gum in her hair, or dirt on her bum, or dear doG, please, don’t have me in heels when the Apocalypse comes! I love how Kerry grew throughout the story, and finally came into her own. Read this. Enjoy! Tell. Your. Friends!